Crowned World champions in the Paris suburb of Bercy at the Liebherr 2013 World Championships but never in the final a Men’s Doubles event on the ITTF World Tour; in Kitakyushu on Friday 8th June, Chen Chien-An and Chuang Chih-Yuan were upstaged by their younger Chinese Taipei colleagues. 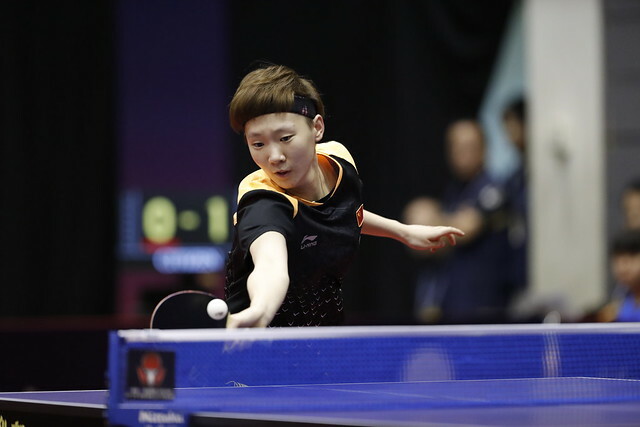 At the quarter-final stage at the Seamaster 2018 ITTF World Tour Lion Japan Open, the gremlins struck once again; for Liao Cheng-Ting and Lin Yun-Yu, very much a new partnership and finding their feet on the international stage, it was success. The no.6 seeds, Chen Chien-An and Chuang Chih-Yuan experienced defeat at the hands Ho Kwan Kit and Wong Chun Ting, the top seeds and a pair very much in form; notably two weeks ago on home soil they emerged successful at the Seamaster 2018 ITTF World Tour, Hang Seng Hong Kong Open. In Kitakyushu, a five games reverse was the outcome (11-3, 7-11, 9-11, 11-6, 11-5). Conversely, Liao Cheng-Ting and Lin Yun-Ju, not seeded, emerged successful; they accounted for Germany’s Benedikt Duda and Qiu Dang in four games (5-11, 11-7, 12-10, 11-7), a pair very much in form. In the opening round they had beaten Japan’s Jin Ueda and Maharu Yoshimura, the no.2 seeds (11-9, 7-11, 11-9, 5-11, 11-9). Surprise semi-finalists in the guise of Liao Cheng-Ting and Lin Yun-Ju; there was one more unexpected combination to advance to the round of the last four and as a result the end of Japanese hopes. Liang Jingkun and Zhou Kai, not seeded, beat Tomokazu Harimoto and Yuto Kizukuri, the no.4 seeds (9-11, 11-7, 11-6, 11-7). Success contrary to status; in the one remaining quarter-final engagement matters concluded as anticipated. An all Korea Republic affair witnessed success for Jeoung Youngsik and Lee Sangsu, the no.3 seeds in opposition to Jang Woojin and Lim Jonghoon, the no.8 seeds (12-10, 12-10, 11-8). At the semi-final stage Ho Kwan Kit and Wong Chun Ting meet Jeoung Youngsik and Lee Sangsu; Liang Jiangkun and Zhou Kai face Liao Cheng-Ting and Lin Yun-Ju. The matches are scheduled for Saturday 9th June.